Keech Australia swapped mining for medicine at an internal fundraising event today, which saw over thirty employees take part in the international Ice Bucket phenomenon in support of Motor Neurone Disease. 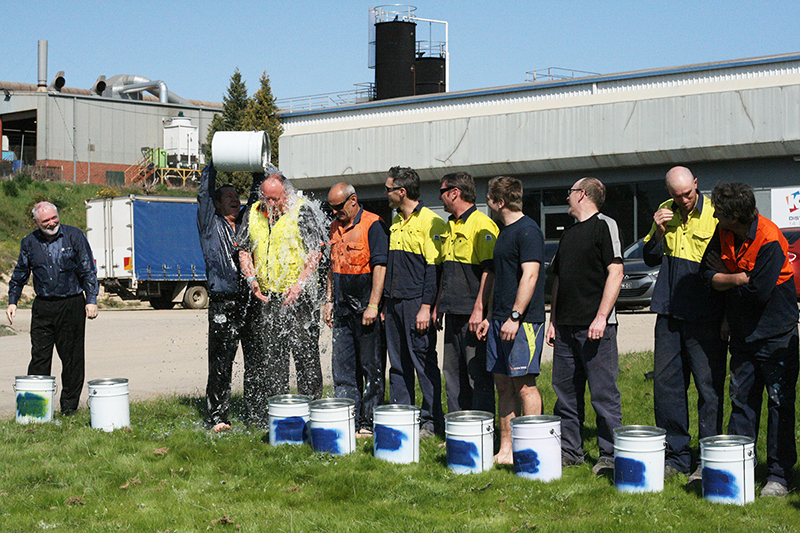 Employees were ‘iced’ outside the Keech Distribution Centre today, after enjoying the warm weather with a sausage sizzle fundraiser. Keech management is donating a cool ten dollars on behalf of each employee who took up the challenge. The fundraiser was a great success with around eleven hundred dollars raised in total for Motor Neurone Disease Victoria. Keech employees Josh Brown and Mark Scott learnt of the Ice Bucket Challenge through social media and decided it was a cause worth supporting. “Once we started asking around for support we realised quite a few colleagues had been touched with personal experiences of Motor Neurone Disease,” said Mr Scott. Keech 3D Sales and Marketing Manager, Duncan McAdams, knows first hand how devastating MND is after watching his father suffer the disease for several months. “His life disintegrated into nothing after a very short period of time,” said Mr McAdams. Keech received strong support from employees and local businesses including IGA Long Gully and 2 Cool Ice & Fishing. The Ice Bucket Challenge has helped Motor Neurone Disease Victoria raise over 30,000 dollars and was mentioned more than 2.2 million times on Twitter between July 29 and August 17 2014.